I really love a slow cooked meal. I think there’s something special about the flavours mingling for hours in a gentle oven. I use some of our own venison instead of beef, and use pieces instead of mince, as it stands up better to the long cooking time. Although I’ve used mince on occasion if you are looking for the more “authentic” look and feel to your chilli. I think the secret to a good chilli is not to use a bought chilli sauce but make up what’s called a colorado sauce. 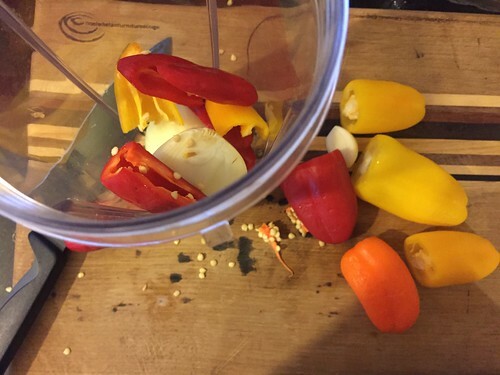 It’s a blend of peppers, chillis, onion and garlic. And you can mix up the quantities to make it as hot or not, as you want it. I mix it up in my Nutri bullet- making extra sure to wash it properly before making the smoothie later on. I simply brown the meat, season well, add a couple of chopped green peppers, onions and some crushed garlic. Add the sauce, and enough water to cover the meat, cover with a tight fitting lid and Bob’s your uncle. 3 to 5 hours later it’s ready. 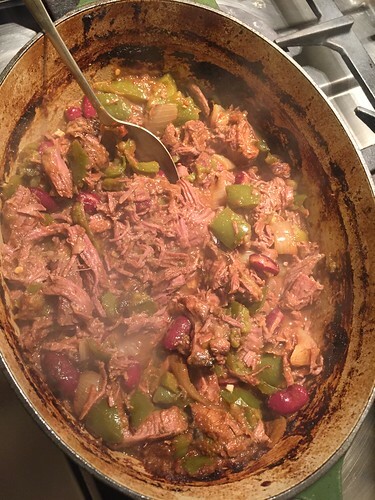 About 30 minutes before serving I add in a tablespoon of tomato puree, a small tin of drained and rinsed kidney beans, and a teaspoon of ground cumin. To be fair, it doesn’t look anything special, but I promise it has a depth of flavour that is a million miles away from the packets you buy in the shops. And even though I am not a fan of kidney beans (or any pulses truth be told), I like them in this dish. And that’s saying something. If it was the last food on earth I wouldn’t touch baked beans, or bean salad. And as for cannelloni beans. They really only are useful dried for blind baking pastry. The traditional accompaniments of chilli are grated cheese, sour cream and maybe some more diced onions and peppers. Served with mashed potato it simply warms the cockles of the heart. And I know if I ever get to Texas it’s the “national” dish, I’ll be able to eat. It’s also a great dish to scale up. I’ve cooked the beef version for up to 50 people quite easily- but there’s a little more chopping involved! And if you ever have any over you can always freeze it. Like most stews it sometimes benefits from the process- no idea of the science behind that!